The history: Designed in 1969 by Aldo Cipullo, the LOVE bracelet was created as the ultimate symbol of a strong bond and commitment between two people. Nearly half a century later, the bracelet remains one of the most iconic fine jewelry pieces on the market. The design: The bracelet is available in yellow gold, rose gold and white gold. The yellow and rose gold version starts at $6300 while the white gold version is a bit higher at $6750. The LOVE bracelet comes in 2 different widths: the original (which I have) and the mini LOVE (super cute!). If you love stacking your bracelets, the mini version is a great option. I might get one for my daughter when she turns 18. The bracelet features a wrist-hugging oval shape which makes it so comfortable to wear even though it has a good weight to it. You'll get used to wearing it after a few weeks. The LOVE bracelet is available in 7 sizes, ranging from 15cm - 21cm. Mine is a size 16 (my wrist measures 5.5"). You can't see any space but there is room for the bracelet to move up and down my wrist. Original version vs. New version: The bracelets were originally made in silver and gold plated. However, Cartier made the switch in 2008(?) and now all their LOVE bracelets are produced from solid gold. 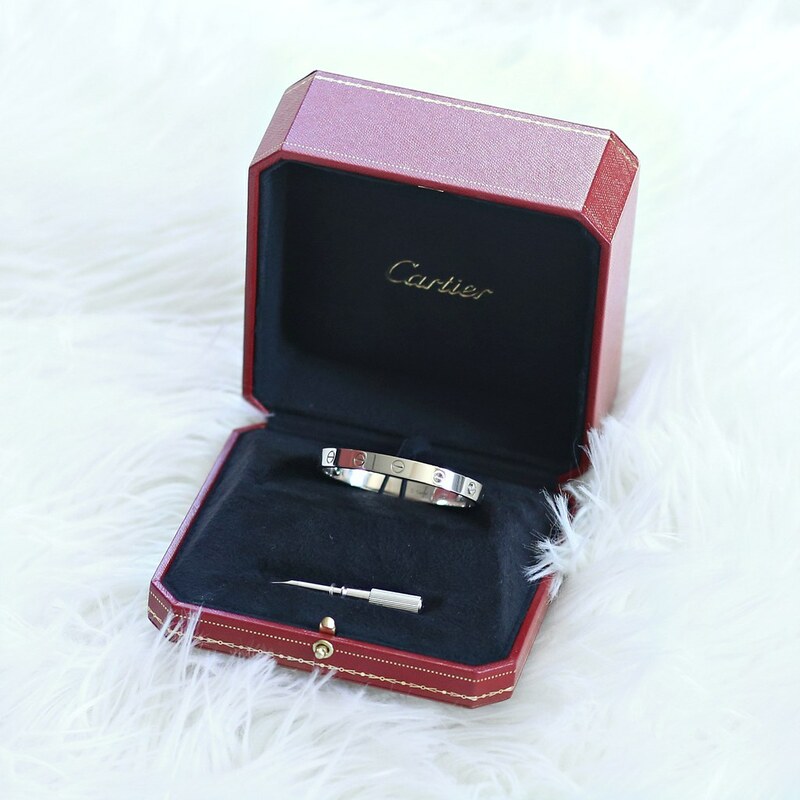 In 2011, Cartier also introduced their new screw system. Prior to 2011, the screws on the bracelets come out completely. The screws on bracelets produced after the year of 2011 only come out partially. Some people like the original version and some prefer the new version. It's a personal choice. Pre-owned vs. Brand new: Certificate of authenticity included with each bracelet. However, as far as I know, it's extremely difficult to authenticate a Cartier piece. The SA told me the only way to find out more about the piece is to search for the serial number in their database. 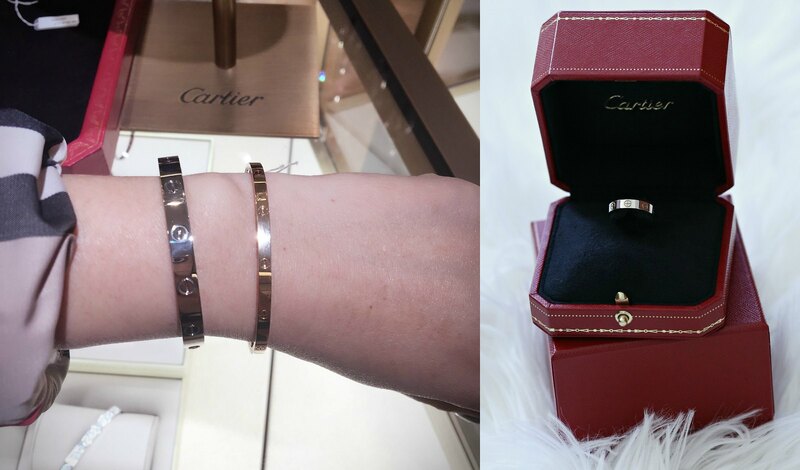 Cartier bracelets do scratch and they scratch very easily. Looking at a pre-owned piece, it's impossible to tell how many times the piece has been polished. If it's been polished too many times, it will thin out your bracelet and that's not what you want. There is nothing wrong with finding a pre-loved bracelet but those are just a few things to keep in mind. Care for the bracelet: As mentioned above, they scratch very easily. For the first couple of weeks, make sure you're aware of it and try not to bang it against anything. You'll get used to it in no time. During workouts, I put this wristband around the bracelet. It does a good job of protecting it. The SA gave me a cleaning kit at the time of purchase. I haven't used it yet but she said the cloth does a good job of taking out hairline scratches. Cartier does not recommend polishing your pieces regularly (maybe once every 3 years or so). I believe the polishing service is complementary. The engraving service is free as well. My ring is engraved with our wedding date. When I self tanning at home, I wrap it in plastic wrap before putting on my tanning lotion just so the lotion won't get in between the screws. When putting it on or taking it off, make sure you do short turns instead of one big turn to avoid slipping (I learned that from the SA). I don't really baby the bracelet. Those are just a few things I keep in mind to keep the bracelet shiny as long as I can. I guess this varies from person to person, depending how careful they are with the bracelet, but how scratched up is your bracelet after your 9 months of wear? If it is noticeably scratched, did that happen within the first few months? There are hairline scratches but nothing major. Still looking beautiful and shiny.